At The Old Church, Stoke Newington. 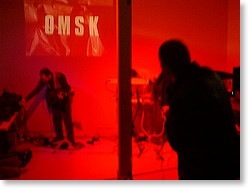 Part of the Soundscapism concert series, at The Banshee Labyrinth, Edinburgh. Champion Version’s Edition 1: Rothko, Yellow6, Darkroom, Machinefabriek. At I K L E C T I K, London SE1 7LG. At the Cos Chapman Open Jack Takeover, New River Studios, London. The Art Pavilion, Mile End Park, London, October 20th 2016, as part of "Rest & its discontents", curated by Hubbub. Secret Garden Party 2016, in collaboration with Guerilla Science. In the foyer of the Wellcome Collection, Euston Road, London. Streamed to the internet via mixlr. Tannery Arts Center, Santa Cruz, California, USA. Anno Domini Gallery, San José, California, USA. Listening Club V, at The Peckham Pelican, London. Sonic Imperfections at The Montague Arms, 289 Queen’s Road, London. Tuesdays Post, Letchworth Edition, at Dot To Dot, Letchworth Garden City. Tuesdays Post series 2 gig 2, at the Strongroom Bar, London. Tuesdays Post series 2 opening night, at the Strongroom Bar, London. Darkroom at The Barbican 15/8/2013 on Vimeo. Solo performance by Andrew Ostler of Darkroom, at the London Music Hackspace Performance Night, part of Hack The Barbican 2013. Andrew Ostler at The Barbican 15/8/2013 on Vimeo. At the Music Hackspace performance night. Darkroom at Troyganic Cafe 8/11/2012 from Andrew Ostler on Vimeo. Over-the-internet performance with Per Boysen and Jim Goodin, as part of the Y2K6 International Live Looping Festival. 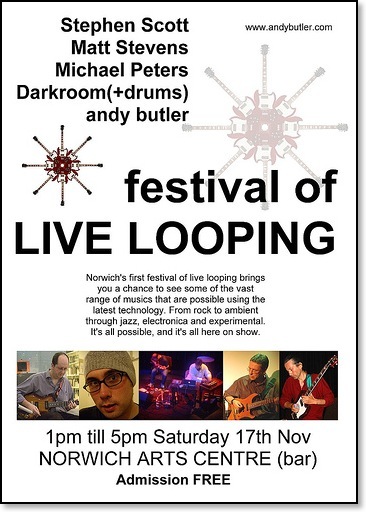 Held at the Old Bata Shoe Factory, Norwich. Held at The Assembly House Restaurant Room, Theatre Street, Norwich. Held at the Unitarian Church, Cambridge. Organised by Adrian Newton, aka Nemeton, who went on to remix Darkroom for the DAC Mixes album. "Darkroom - Keeping Ambience Live"
Extended performance/installation. Held in the Cambridge Museum of Technology. Held at the Cambridge Drama Centre. Held at The Moon, Cambridge. 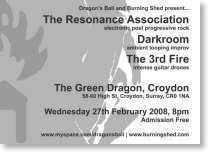 To date, the only occasion on which Mike has played bass at a Darkroom gig. To date, the only Os/Tim duet. Held at The Scala, London. We were providing a live soundtrack to the Roswell Alien Autopsy film - revisiting the first ever Darkroom (then Collective) appearance back in 1996. Held at The Queens Arms, Penton St., London N1. Haunting and arresting, "Darkroom" are an improvising group (more "Starsailor" than Machine Gun) of shifting and unsettling atmospheres. The two instrumentalists construct an environment of mutating loops - while Tim Bowness (of No Man) uses his extraordinary and evocative voice to add an emotional centre to the music. - the phrase "rich hippy" was levelled at Mike, apparently because he had more than two guitar pedals. We played two sets, and I remember it being a good gig. Sadly, it was one of the few that we didn't record. We were booked to play as part of The Halloween Society's line-up. Unfortunately 1997 was "the year of the mud" and the stage we were booked to play on sank into the mire. We were bumped to the Wise Crone Cafe tent, and eventually managed to play for 5 minutes sometime in the small hours of the following morning (shortly after the sound man went home for the night, so we were left to engineer the gig too). All in all, a terrible experience. We didn't record it. I can honestly say I remember nothing about how it sounded - at the time I was simply grateful to be making any sound at all.